Cliff Hangers - Lincoln quote " Like an ox jumped halfway over the fence." 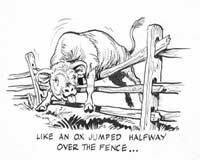 - Ostendorf depicts the Lincoln quote by drawing an ox halfway over a fence. "Get a good ready," by Lincoln.Abraham Lincoln is shaking hands with the crowd of supporters.Abraham Lincoln is shaking hands with the crowd of supporters.Abraham Lincoln knew the common people, their customs, folklore and feelings...and their colorful expressions. Abraham Lincoln knew the common people, their customs, folklore and feelings...and their colorful expressions. Subject: Lincoln quote " Like an ox jumped halfway over the fence." Description: Ostendorf depicts the Lincoln quote by drawing an ox halfway over a fence. Copyright © 2005-2007 Interactive Data Technologies.